The Iranian Olympic Committee has called on Muslim states around the world to protest to FIFA and the International Olympic Committee (IOC) after the country’s women’s football team were banned were from wearing the hijab at this year’s inaugural Summer Youth Olympic Games in Singapore. Bahram Afsharzadeh, the secretary general of Iran’s Olympic Committee, claimed the decision is a violation of Muslims rights. The team, who qualified to compete in the Games, which are due to be held between August 14 and 26, wearing head scarves, have been informed by FIFA that they will not be allowed to compete unless they remove the hijab. Ali Kafashian, the President of the Iran Football Association, has written to FIFA to ask them to reconsider their decision, claiming that due to religious beliefs the team will be able to participate in the competitions only if they are allowed to observe the Islamic dress code. 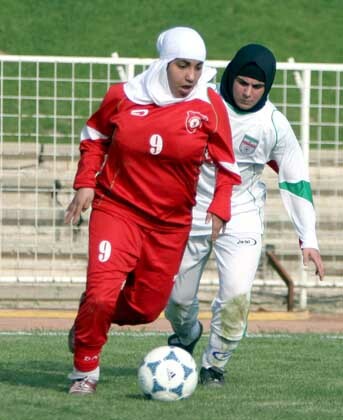 FIFA had passed a ruling in March 2007 that the hijab is forbidden in matches. It came after a Canadian Muslim was expelled from a match for donning a hijab. The decision, taken by the International Football Association Board (IFAB), the body which decides the laws of the game and is made up of the four FA’s from the United Kingdom and FIFA, cited law 4 which lists the basic equipment that players are allowed to wear and does not include headwear except for the goalkeeper. Afsharzadeh said the decision taken FIFA proves that it does “not” care about such issues as nationality, religion and race. It is also an indication of creating obstacles on their part in the way of the women’s progress, he added. Iran’s National Olympic Committee has forwarded copies of a protest letter to the IOC and a number of other leading officials around to consider the issue, Afsharzadeh said. Several athletes competed at the Olympics in Beijing in 2008 wearing a hijab, including Bahrain sprinter Ruqaya Al-Ghasara, the 2006 Asian Games 100 metres champion and carried her country’s flag in the Opening Ceremony.